An artifact needs to possess a human-level social-emotional intelligence in order to be accepted as a team member and to be productive in the team. A general theoretical model describing this kind of artificial intelligence is currently missing. 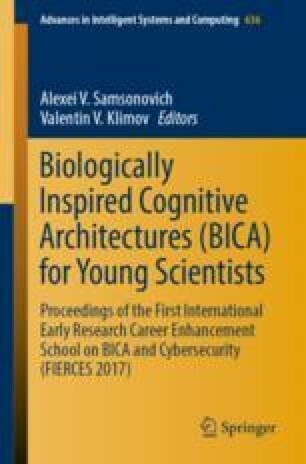 This work makes one step toward its development, using a simplistic virtual environment paradigm and an emotional biologically inspired cognitive architecture as the basis. We describe a Virtual Actor model supporting believable character reasoning. The model was implemented and tested in a pilot experiment in a virtual environment involving human participants. Preliminary results indicate that a Virtual Actor of this sort can be believable and socially acceptable in a small heterogeneous group. We are grateful to NRNU MEPhI Students who contributed to this study as participants or developers, in particular, to Mr. Arthur Chubarov for creating the virtual environment platform used in experiments, and to Mr. Daniil Azarnov for valuable discussions. This work was supported by the RSF Grant # 15-11-30014.